Long ago, in a walled off land, far to the north, a great king built a great kingdom. I believe they called it Drangleic. No, how could you be. But one day, you will stand before its decrepit gate. A thunderstorm unleashes its torrential fury as I trek through a deserted forest, dressed in rags befitting a beggar. I am cursed, marked with the brand of the undead curse. This is the fate of all who decide to test their mettle against the might of a Dark Souls game, and I have come to challenge Dark Souls II: Scholar of the First Sin. The difference in Dark Souls II is that in addition to being cursed with the undead brand, my memories are slipping through my fingers like sand. I have no memories of home, only the urge to find some sort of cure for my ailment. Upon traversing a lake in a simple paddleboat, a great vortex churns before me in the middle of the water. Beckoned by fate, I step forward, and fall into the portal that sends me on my adventure to the land of Drangleic, the world of Dark Souls II. Though I am just a player sitting in my computer chair, I feel as if I’m transported as well into this beautiful, yet dangerous world. The next thing I know, I’ve arrived in a land called Things Betwixt, a limbo land on the outskirts of Drangleic. As I wander about for shelter, there is a cottage in the distance with lights in the window. I stagger inside, hoping someone can help me gather my bearings in this unfamiliar land. I find a group of old hags sitting around a fire, knitting and rocking in their chairs. They mock me, laughing at my decrepit state. “An undead has come to play, heh heh,” the main firekeeper chuckles. They speak to me as though I’m not the first undead to reach their home, and I likely won’t be the last. The head crone smirks with rotten teeth and asks if I can even remember my own name. I struggle, searching deep within my addled mind for something familiar. I search the recesses of my mostly empty mind until a name sticks out to me. I tell the firekeeper what I think my name is, and she nods in approval. The old hag then hands me a little wicker figurine, a human effigy she calls it, and asks me to tell her what it looks like. I peer at it long enough until I reach an epiphany; it’s me. I am MacGreggor the Cleric, a warrior who can use the art of miracles to heal, and craft lightning to strike down my foes. I shed my rags and appear as a proper cleric should. The women laugh as I shuffle dumbly through the exit. There’s nothing else to do but move onwards. Their words echo through my mind as I fight my way through the tutorial lands of Things Betwixt. I’ll show them, I think as I swing my mace on a dagger armed hollow. I will see this quest to its end. As I leave Things Betwixt, I feel the warmth of the sun for the first time. I’ve reached the rocky beach of a desolate seaside town. This little village is called Majula, and it will be my home for the entirety of my long journey. As I step towards the bonfire situated next to a cliff looking out to the sea, there is a strange woman there dressed in a green cloak, staring off at the ocean. I approach her, and she addresses me with a simple question. This question is the foundation of my quest, my journey through Drangleic. The woman, known as The Emerald Herald, tells me to seek a great old king, the one who shaped this land into what it is—King Vendrick. Yet I cannot do so at the moment. My soul is weak, untested, and to become a monarch, I must complete a trial worthy of a king. “Bearer of the curse, seek misery. For misery will lead you to greater, stronger souls. You will never meet the king with a soul so frail and pallid,” says the Emerald Herald. Four great souls await me, held by imposing figures of Drangleic’s past. They will test me in battle, and I must defeat them if I am to seek audience with Vendrick. I have a long journey ahead of me, and path is wrought with danger. There’s the Lost Sinner, imprisoned in a cell within the stronghold of Sinner’s Rise, hidden within the many jails of the Lost Bastille. She is a blind swordswoman, bound in chains. Though weighed down, she carries a sword and will sunder those who underestimate her prowess. Upon entering her prison, she blows out all the lights, trapping me with her in the darkness and evening the odds against me. Deep underneath the ground of Majula in the poison pits of the Black Gulch stands The Rotten, a beast made up of an amalgamation of decaying corpses. Surrounded by ever burning fire pits, the Rotten cleaves all who foolishly enter into his domain. Protecting the path to him stand countless poison spitting statues, as well as frightening subterranean creatures that would make Lovecraft shutter. Past the Shaded Woods and the caves of the Doors of Pharros lies the mining town ofBrightstone Cove Tseldora. The sandy town is overrun with menacing spiders, and its mindless inhabitants are slowly turning into arachnids themselves. The spiders all share one mother, the frightening Duke’s Dear Freja. Once a pet, upon gaining a great soul, the two-headed spider grew to a monstrous size. Venturing down webs to her arena is not for the faint of heart, and she waits with her brood for the next meal to walk into her domain. Legends speak of a mighty iron castle known for its strength and power. Yet now the castle sits deep within a lava pit, brought down from the weight of its beloved iron. The Old Iron King was once a cruel ruler who took pleasure in killing the undead, yet his strength was his undoing. His castle unearthed a powerful demon, which killed the king and possessed his body. The king now waits at the foot of his castle, ready to incinerate those who face him. Reaching these great souls is not an easy task, and there are many other lands I must cross to reach my foes. There is the Forest of Fallen Giants, once a great and mighty fortress. Once, there was a war between Vendrick’s army and the Giants from across the sea. Here my journey begins, facing hollow soldiers who continue defending their fortress long after the battle that destroyed their battlement. In the heart of this fort lies The Last Giant, the sole remaining Giant from this war who seeks an end to his suffering. There is also The Pursuer, a well-armed knight that hunts down any undead who seeks the throne. Though I am able to strike down The Pursuer, he continues to pop up in other lands to test my nerve in battle. The Huntsman’s Copse is a woodland, filled with trees watered from the blood of undead. The Old Iron King once hunted undead in these woods, and his minions still lurk around, ambushing wayward undead seeking passage. Close by stands the Undead Purgatory, where a fierce chariot thunders through the streets, ready to trample any who foolishly wander into its domain. All these lands and more circle around the final goal of the quest, Drangleic Castle. This is the residence of the man who made the land what it is today, King Vendrick, The king instilled such loyalty from his followers that they turned to stone standing guard from staying in their post for ages. But only those who have conquered the many trials of Drangleic can seek an audience with the king and queen. I have seen all of these places through the eyes of MacGreggor, my avatar. Yet every step he took, I felt as though I made the journey myself. Through the seventy plus hours I spent in the land of Drangleic, I climbed the tallest heights of the Dragon Sanctuary and plunged into the deepest depths of Black Gulch. I’ve clashed blades with hollows and invading human players alike. I’ve suffered the pain of losing countless souls, and the glorious elation of defeating the most intimidating of bosses. Every minute spent playing Dark Souls II were some of the greatest moments I’ve ever had playing a video game. I did not make this journey alone, either. Throughout the game, I ran into the invisible phantoms of fellow players who were on an incredible journey of their own. Many times I called upon the help of another sojourner who had placed their summon sign in front of a difficult boss. Once I’d defeat a boss, I would place my own sign down, and accompany someone who I’ll never meet in real life and aid them in overcoming their own trial. Some of the most rewarding experiences I’ve had in a video game came from helping a struggling soul finally put down the foe that had given them so much trouble. These moments celebrating with my host filled me with more joy than defeating the boss on my own. However, not every interaction with another player came under such enjoyable circumstances. I had to be on guard, as at any moment another person could invade my game and hunt me down for souls. Player dueling offers a tense and stressful experience for any adventurer. While I learned the patterns and fighting styles of normal enemies, a human player is unpredictable, never offering the same experience twice. Many times I fell to their blade or magic, but banishing an invader gave me a bigger sense of accomplishment than finishing off a boss. These moments working cooperatively with another player or fighting an imposing invader gave me an experience unlike any other game I’ve ever played. I never play online multiplayer games, as I lack the confidence in my abilities as a gamer. 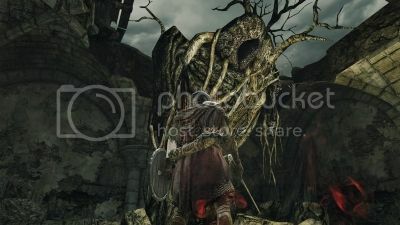 The Dark Souls series, especially DSII, forced me to face these fears, and I’m glad it did. Instead of looking for ways to avoid other players, I’ll place my sign down for PVP duels, something I never thought I’d ever do. When another player invades me, I’ll give them a friendly wave, and more often than not they’ll wave back. Sure, they’re trying to kill me, but it’s all in good fun. While I enjoy all the entries in the Souls series, Dark Souls II holds a special place in my heart. One of the reasons comes from the story. While Dark Souls II eschews most of the lore and characters from Dark Souls I, this allows the game to tell its own tale rather than rely solely on callbacks from previous entries. Dark Souls II’s story is reminiscent of a fairy tale told around a bonfire. Each area acts as a chapter in a storybook, centering on characters that have become corrupted and fallen from grace. Take for instance Mytha, queen of Harvest Valley and Earthen Peak. Queen Mytha pined for the attention of a nearby king, so she sought to enhance her beauty by drinking a potion crafted from her lands. The king paid her no mind, and soon Mytha earned the title of the Baneful Queen. The queen’s jealousy became so potent that it ruined her kingdom, filling it with noxious poison. The poison transformed the once beautiful queen into a hideous serpentine monstrosity, and the toxic poison that is lethal to the player heals her. Another fairy tale motif can be found in the two bell towers in Drangleic, Belfry Luna and Belfry Sol. These two hidden areas were built to commemorate the undying love of a princess and prince from long ago. The two royals had a doomed romance, and these bell towers were erected to symbolize their undying love and a hope that one day they could reunite and wed. The princess and prince crafted living marionette soldiers who stand guard in the towers to protect the bells. These marionettes stand guard to this day, though the lovers have most certainly perished long ago. In addition to the story, one of Dark Souls II’s greatest strengths is its quest. Dark Souls II is a lengthy game, longer than any Souls game in the series. DSII didn’t feel like just a game to me as I immersed myself in it, but rather a grand adventure that I experienced firsthand. Every time I cleared a boss, I’d rush to the next area with anticipation of what was next in store, and what new lands I’d get to explore. As a lover of ruins and abandoned places, Dark Souls II is brimming with castles and keeps to investigate. I explored every inch of Drangleic, soaking in the atmosphere wherever I went. 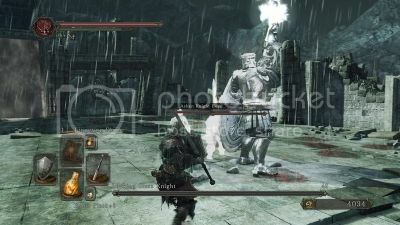 While the Souls series has a reputation for its fierce difficulty, the game provides the player with countless builds, weapons, and spells to overcome adversity. With my character, I fought with strength weapons and used miracles for healing and buffs. While my build saw me through the game, I can start over and try countless other builds and weapons to accomplish the same goal. I never ran into another player who played exactly like me. Some players were spellcasters, others used flashy rapiers with a focus on dexterity. Any play style can carry a player through the game, with spikes of difficulty here and there to balance the experience. The often-touted difficulty of the Souls games like Dark Souls II is honestly a detriment to the series, as it’s a false barrier of entry for many prospective players. Many times when I’ve told people that I’m playing Dark Souls II, they’ll look at me in amazement and say they’d never try a Souls game based on the difficulty alone. I avoided the Souls series for years from their reputation alone, as I hate trudging through difficult games, only to give up in frustration. Once I gave Dark Souls and Dark Souls II a shot, I learned the challenging Souls games aren’t something to fear, but relish and enjoy. Every time I finished an area like Huntsman’s Copse, I felt like I mastered a new section of the game. There’s a true sense of accomplishment with every victory won. 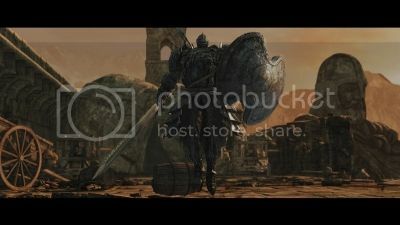 As harsh as death is in the Souls series, it only makes victory all the sweeter. Yet don’t let the difficulty keep you from trying a Souls game, as there’s so much more to Dark Souls II than just constant death. The lush world design, the hidden lore, the vast amount of weapons and abilities, and unique multiplayer encounters keep me playing long after I finished the main quest of Dark Souls II. I’m still playing my original character, as well as several new builds to try for fun. I’d suggest that any fan of RPGs or adventure games give Dark Souls II a try. It might not be everyone’s cup of tea, but you won’t know unless you try. You might find, like I did, that it’s one of the best gaming experiences I’ve had since picking up my NES controller so many years ago. I climb the long steps outside Drangleic Castle, weary to end my long quest. I’ve died countless times, only to resurrect and try again and again. Yet my journey is almost at an end. I can feel it in my bones. There are two massive guardians wielding deadly halberds, ready to cleave my body in two. Yet there is a friendly face standing at the foot of the stairs—the Emerald Herald. She greets me at the foot of my last great task. “This castle is isolated. But nonetheless, you must forge on. To bring an end to your journey…and mine,” she tells me. I hoist my blade and begin my ascent towards my enemies. The words of the Emerald Herald continue on as my foes begin their charge. I charge ahead with my blade, throwing caution to the wind. I will not be denied my victory, no matter how many times it takes me. All Photos come from my playthrough of Dark Souls II: Scholar of the First Sin on Steam.